Home » Blogs » Unenergy's blog » Punk'd or Monck'd? On 19 October 2009 a fellow by the name of Christopher Monckton, 3rd Viscount Monckton of Brenchley, burst onto the scene on a Glenn Beck radio program claiming all sorts of outrageous conspiracies around climate, the IPCC and the UN were taking place which we did not know about due to suppression of the press. He was educated at Harrow School, Churchill College, Cambridge, where he received a BA (Honours) in classics in 1973, and an MA in 1974, and University College, Cardiff, where he obtained a diploma in Journalism Studies. Being a journalist in the UK we are able to establish there existed a long standing relationship with News Limited, News Corp or more specifically, Rupert Murdoch's media empire. Ferdinand Mount, the head of the Number 10 Policy Unit and a former CPS director, brought Monckton into the Policy Unit in 1982, where he worked until 1986 as a special advisor on economic matters. He left the Policy Unit (1986) to become assistant editor of the newly established, and now defunct, tabloid newspaper Today. Today was sold to Rupert Murdoch's News International in 1987. So on 30 October 2009 Lord Christopher Monckton gets an entire hour on Rupert Murdoch's, News Corp Fox News channel on the Glenn Beck show to discuss his claim that a worldwide scientific conspiracy is going on with climate science and he is being muzzled by a press/media uninterested or intentionally ignoring the story. But if we go back, way back to 1 August 2008, we see another News Corp publication blogger, (a blogger with his own moderators and staff supplied by News Corp), publish a post mentioning this Monckton character who attacked Australia's federal government over proposed carbon emission mitigation policy. An English hereditary Lord, who used to work for a News Corp publication, never elected to office in any way in the UK, gets press in Australia in a different News Corp publication warning our elected leaders on what is good for Australians. Next up on 11 November 2009, Lord Monckton was interviewed by one of Australia's most prominent radio personalities, Alan Jones. Alan's position mimicked Lord Monckton's in his belief that a conspiracy existed. He pushed the line that suppression by the press needed to be counter balanced by an 'honest' radio announcer. Rewinding a bit here, as although I'd watched this gentleman talk about conspiracy theories on Glenn Beck's show, I knew he was able to speak well enough and had strung together enough of an alternative story to muddy the waters around climate science, that some people would take what he had been saying as the truth. However the alarm bells started going off big time when, in response to young people exercising their democratic right to free speech, including many Americans, when they voiced their concern at what they saw as misrepresentations being spread by Mr Monckton they were labelled with the term 'Hitler Youth'. Anyone making that sort of comment as reaction to people in disagreement, particularly with such a carefully nurtured profile as Monckton had, warrants additional scrutiny. His first (and second) faux pas was reiterated in this video which I wrote a diary on. It's all opinion dressed up as fact, but there was one particular line in this interview which made me sit up and pay attention, as looking at Monckton's past work history as an arts and journalism student as well as working for a Murdoch publication, would this be an area he would necessarily have first hand knowledge of? Coal and Oil are just as clean as any other form of energy. So it does show if you use modern methods of combustion which are designed to achieve a much more complete burn, then you dont get the problems we used to get, which have largely been solved in the West. I agree there are problems in the poorer countries, like India and China, simply because their governments haven't taken the decisions that they could take if they wish, to use the modern technology. I think they should and I don't see any reason why we shouldn't help them to do that. In the 11th plan from 2006-2010 the six major Chinese utilities will install 300 new SO2 flue gas desulfurization (FGD) systems. Since they plan to install FGD on all units and the U.S. has not yet made that commitment, it is only a matter of a few years before China becomes the scrubber leader. FGD = Flue Gas Desulfurization or the removal of acid rain causing gases. China has policy to require power stations to have this, the United States does not. Further China is using modern technology to build their power stations and add to their grid build out, whereas countries such as the United States, Australia and even the UK, have stations which were built 10, 20, up to 60 years ago with the technology available at the time. This, drawing on my own knowledge and experience, was a big fail by Monckton. Further, not only is this simply putting up a false equivalency, or more accurately, 'look, they are worse' argument, it is simply incorrect. Shooting from the hip with either a talking point which the fossil fuel industry would pay to hear, ignorance presented as fact, or an intentional misrepresentation. The story goes like this : A couple of Australian Engineers so enamoured by the story Lord Monckton had to tell, considered putting up their homes for mortgage in order to finance sponsoring him to tell of the things which News Corp's Glenn Beck had just shown on Fox News. The climate change sceptic will carry out an extensive 13-day lecture tour of Australia at an estimated cost of $100,000. The cost is being covered by two semi-retired Queensland engineers, John Smeed and Case Smit. An idea that stemmed from a few drinks between friends will now be backed by Australia’s richest woman Gina Rinehart and be made into a documentary with the BBC. These are the tour dates of Moncktons tour and we are to believe, financed with $100,000 by a couple of guys in a pub/bar. And of course he had News Corp providing plenty of coverage for this grass roots, spur of the moment tour, who would bring balance to these poor, hard done by climate skeptics who'd been ignored, seemingly intentionally, by the mainstream media. So what did Mr Monckton have to say that News Corp, his former employer, would provide so much positive and supportive coverage of the message? Business Consultant, Policy Advisor, Writer, Columnist, Inventor and Hereditary Peer. He served as an advisor to Margaret Thatchers policy unit in the 1980's and invented the eternity puzzle at the end of the 1990's, as well as the Eternity 2 in 2007. Educated in the classics at Cainbridge and with a Diploma in Journalism Studies from university college Cardiff, Lord Monckton joined the Yorkshire Post before continuing his career as a media writer and editor and a press officer for the Conservative Central Office. Author comment : Why no mention that the good Lord once worked for News Corp owned Today Newspaper? ...and I'm going to try and boil that down, as every policy maker not expert in the field must, to one question which seems to hold the key to the entire debate. And that question is known to climate scientists as the climate sensitivity question. That is the question, how much Warming will you get, if you increase, as we are increasing, the CO2 concentration in the atmosphere. Now, we are going to make, on this side of the house, a number of important and necessary concessions so that we can move this debate forward. We are going to concede that Carbon Dioxide and other Greenhouse Gases which possess or mimic a dipole moment, will cause warming if you add them to the atmosphere. We concede also that human kind is adding CO2 to the atmosphere at about the rate that the NOAA figures mention. So we're not trying to pretend that we're not the cause of the CO2 in the atmosphere increasing, we're not going to try and pretend that that CO2 will cause no warming. What we are going to contend is that, on the measured evidence, the amount of warming it causes is around 1/6th to 1/7th of what the UN thinks it is. Now that is a rather startling claim, and I am going to try to give you some actual evidence for it. Went along fairly flat for a while then in about 1950 or 60, CO2 has shot up and increased quite a lot. And that's because of all the fossil fuels we are burning. But the actual most important thing about this graph is over here on the right, if you can read what that says, that's the radiative forcing. And if it wasn't for that, the fact that we are putting more CO2 in the atmosphere and increasing its concentration, would be just a scientific curiosity. No-one would really care, wouldn't really matter. But radiative forcing is important and I know Lord Monckton explained it to you briefly, but I'll explain it to you just in case so we all know what we are talking about here. We have in the Earth short wave radiation, and that comes in from the sun, and we have long wave radiation that goes out from the Earth. If those two things are equal, the energies are equal, then the Earth will stay the same temperature. But if you have more energy coming in than going out, then you're going to tend to warm the planet, and the difference, it's the difference between incoming and outgoing is called radiative forcing. I've said more coming in than going out, but it can work the other way, you can have more going out that coming in. And that would be a negative forcing and that would tend to cool the planet. ...And we can therefore use satellites to measure not only what temperature was and how it changed over this period from about 1980, '83 onwards. And we can also tell how the outgoing radiation from the Earth's surface changed. It is the relationship between changes in temperature of the Earths Surface and changes in outgoing radiation at the top of the atmosphere that absolutely govern this debate, that's what it's all about. So what we're going to do is we're going to try to explain the one of those three of those relatively rapid periods of warming that we can explain because we've got satellites there. And here in a paper by Pinker et al of 2005 is a graph, which is, pretty boring to look at you might say what's going on here. Well let me add a few details to it so that you can see what's going on. What we have got is a reduction in cloud cover over that 19 year period. 1983 to 2001. A reduction which led to a radiative forcing, as it is called, an extra amount of solar radiation hitting the Earths surface and going out as long wave radiation. 3.04 watts per square meter in just 19 years, now none of you are gasping at that figure, but it is in fact an astonishing figure. The reason why it's astonishing, is that the UN's climate panel, which is probably exaggerating, says that the entire human effect on the climate in the 256 years from 1750 to 2005 inclusive, is just 1.6 watts per square meter. So here we have an enormous naturally occuring forcing verified in Pinker's paper by four seperate methods. Which occurs it seems, we don't know why it occurs, it's a natural reduction in cloud cover, then it comes back again, it's a cyclical thing, and from that we can do a simple calculation. Now I'm not going to go through this graph in detail, you'll be tested on it later. But if his measurement is right, then we can do a very simple back of the envelope calculation and I admit it is a back of the envelope calculation, I don't admit it is the last word on the subject, but what it shows is the ball park within which we are operating here. And what we see is that the warming we would expect to get if we doubled the CO2 concentration in the atmosphere, that is what's known as climate sensitivity, will be about a fifth of a celcius degree, just a little bit more than a fifth of a celsius degree, but the UN is saying it will be 3.26 celcius degrees. 7.5 times too big. Now that is only a back of the envelope calculation, it's very simple, it's very crude, it's very rough and ready. So I communicated this result to a team of mathematicians around the world with whom I discuss these ideas from time to time, one of them, at my request, did a more detailed calculation, and he said sorry mate but you're wrong. Take away the UN's exaggeration and you take away the problem. End of the Science. So far only one of these individuals is engaging in hyperbolic attacks on the integrity of others. We effectively have two individuals in agreement on the fundamental importance of the science, but one who uses unecessary inflammatory language directed at individuals and institutions who are trying to find the truth. They both agree on CO2. One says it will warm the planet by 3 degrees Celsius or more according to the IPCC, the other basing his statements on a paper written by a Pinker et al, says it is overstated by a factor of 7 to 8. And this is where I agree 100% with Lord Monckton. The most important question about the science, and, as you can see, he's agreed with me here. Is the climate sensitivity. It tells us how much warming do you get from a certain amount of radiative forcing in the long run. As an important qualification there what happens if you have a forcing, the planet starts to warm up, but it takes a long time. We have these oceans which take a long time to heat up so to actually get the full amount of warming, from a forcing if it just stays constant, might take a hundred or 200 years. You get a fair bit of it straight away, but then a lot of it takes a much a time to happen. But heres the equation, very simple equation that says the change in temperature, to work that out if you know the forcing, you just have to multiply it by the climate sensitivity. What does that mean? It means if the climate sensitivity is low, as Lord Monckton suggests over there, then we can put lots of CO2 in the atmosphere and things wont warm up very much. So if it's low, there is no problem. And this is where I think we're in complete agreement. If on the other hand it's high, and he has the number for the IPCC up there. If it's high then we do have a problem. Increasing CO2 in the atmosphere will cause quite a bit of warming and that will have all kinds of bad consequences. So if sensitivity is low, no problem, Sensitivity is high, yes theres a problem. That's the key question in this debate. If you think it's low then Lord Monckton wins, if we conclude that it's high then I win the debate. His calculation has 0.43 degrees of warming, and the IPCC thinks its going to be more like 3. So this is it, this is what the whole debate is about. So since this calculation is so simple, there's an obvious question I asked myself, and I hope all of you have been asking yourself, why haven't the climate scientists noticed this? Does Lord Monckton think they're fools? The only conclusion that you can come to is that [the IPCC] were deliberately avoiding the very clear implications of Dr Pinker's paper. They knew perfectly well that if they took proper account of that paper they would have to evaluate climate sensitivity as low by the remarkably simple calculation that I showed you on the screens or something very very close to it. And they simply fudged it because if they did that and admitted that all their previous reports were wrong they'd be out of business before you could say "Jack Robinson". So he doesn't think they're fools, he thinks they're frauds. They're all doing it just for the money. Which is a pretty extraordinary claim, because, well there's lots of scientists, are they all in on it? And then I had another thought, what about Dr Pinker? Why hasn't Dr Pinker spoken up and said “you haven't represented my work fairly”? So the answer is, Pinker is just not interested in that question. Doesn't care. So that was also a surprise to me, that person is completely out of it. So I thought I'd contact Dr Pinker. And the first thing I noticed was that she was a woman. So I communicated this result to a team of mathematicians around the world with whom I discuss these ideas from time to time, one of them, at my request, did a more detailed calculation, and he said sorry mate but you're wrong. Link to part one of debate here. Lord Monckton has clearly made the connection between man, Carbon Dioxide emissions and warming of the atmosphere. He has clearly made the statement that Pinker's 2005 paper he has read and believes it discredits all of the IPCC work on Climate science which is warning of a temperature rise of 3.2 degrees celsius if we stick to business as usual. That with a 'back of the envelope calculation' he has determined they are wrong by a factor of seven. He even makes the point that "we have to check and verify and other people have to come in and look". That was his main argument. Pinker proved the IPCC was wrong, his maths buddies agreed, therefore Australian media, News Corp in particular, relentlessly publicized this man's tour around Australia. And let me tell you, people ate it up. Every bit of it. But he never checked with the author of the paper, if his intepretation was correct. He consistently referred to Pinker as he, his, him. A paper released in 2005 and this debate informing Australian's of this travesty of science was in 2010. 5 years and a thesis which changes direction of policy for an entire country ought to warrant at least a phone call, wouldn't you think. Not only that, Pinker said he had misunderstood her paper and that the IPCC got it right. What hope does humanity have with people like this, a media machine which promotes former employees that claim everyone in the scientific establishment associated with Climate Change is a fraud, that only he knows the truth? 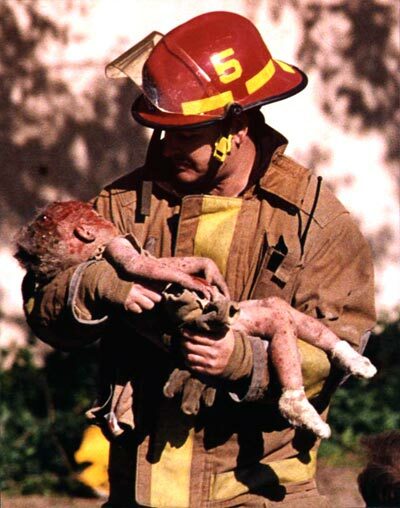 Closure came shortly after a front page of the Oklahoma City bombing showed a fireman carrying the body of a young girl accompanied by the headline "IN THE NAME OF ALLAH", which proved embarrassing when it soon became clear the bombing had nothing to do with Muslim militants but with American extremists. Tell me, what ever happened to integrity, decency but most of all honesty in journalism? I'd expected more from the generation who had opportunities those in future will not ever see, and who have squandered so many chances they had to make the world into a more sustainable, tolerant place. And how sad that a foreigner can come to your country, call American young people 'Hitler Youths', one a Jewish Student, and many Americans who watch Fox News take the side of the foreigner, a hereditary Lord from Britain, over their own. thank you for all your hard work in putting these together and helping to keep us informed -- and educated.